This past school year marks the first for me as principal at my school. One of the exciting opportunities that stand before us as a community is the renewal a large portion of our campus with newer, safer and more modern facilities. With the exciting prospect of building newer walls and spaces, comes a much more profoundly important prospect of examining and renewing the teaching and learning culture at the school. Typically, the idea of building walls gets people's attention. 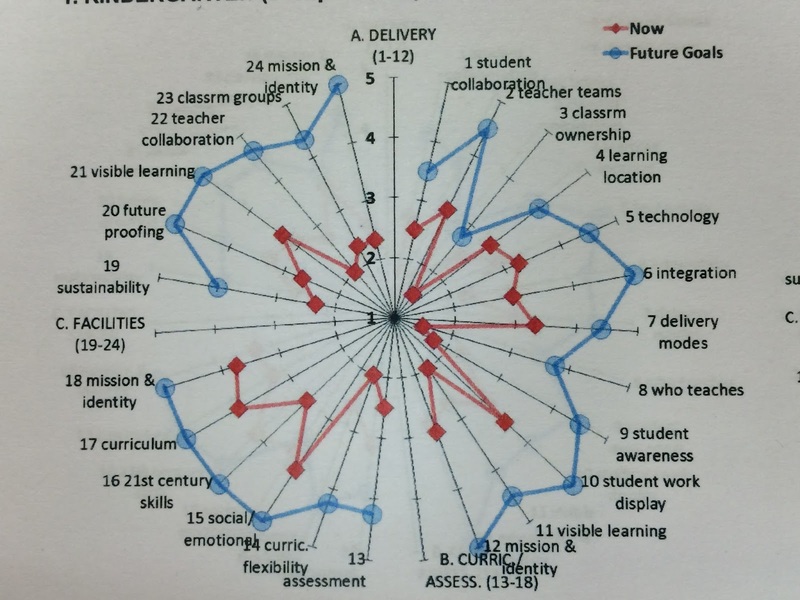 Given that we have peoples', attention, this year we decided to ask one basic and fundamental question: "What should teaching and learning look like at the school in its next century?" We spent the the first five months of the year engaging faculty, staff, parents and students in answering this important question. The process involved surveying and holding small and large group meetings with all stakeholders. Of particular interest was the process for engaging the faculty of the school in asking them important questions about teaching (pedagogy) and learning. 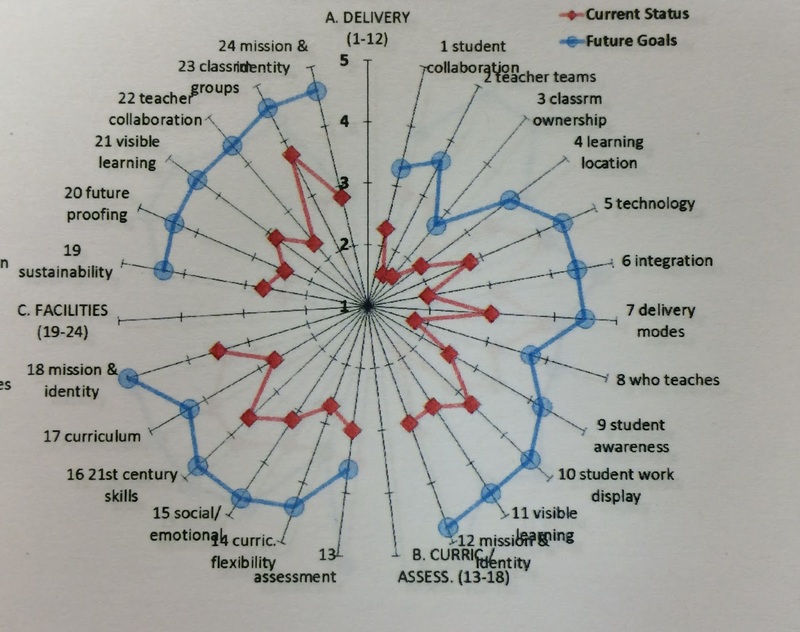 The questions were clustered in three broad categories: Delivery, Curriculum & Assessment, and Facilities. Teachers were asked to reflect on their practice and rate where they see themselves currently and where they might want to be in the future. 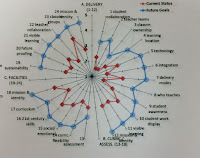 For each pedagogical practice, teachers were give a 5 point scale from "traditional to transformed". For example, in the category of "Delivery" there was a question regarding "delivery modes". Teachers were given descriptors from 1 (traditional) to 5 (transformed) for this question. At the more traditional end of the scale, delivery was described as predominantly teacher direct instruction with little student participation while at the transformed end of the scale you saw more project based, discussion based instruction with direct instruction only when needed (see below for a the sample questions and criteria. The results were then collected and plotted on a spider graph. The intent was to see where staff saw there practice today and where they saw their practice in the future. The graphics below are a sample of a summary of results from a few different department groupings. 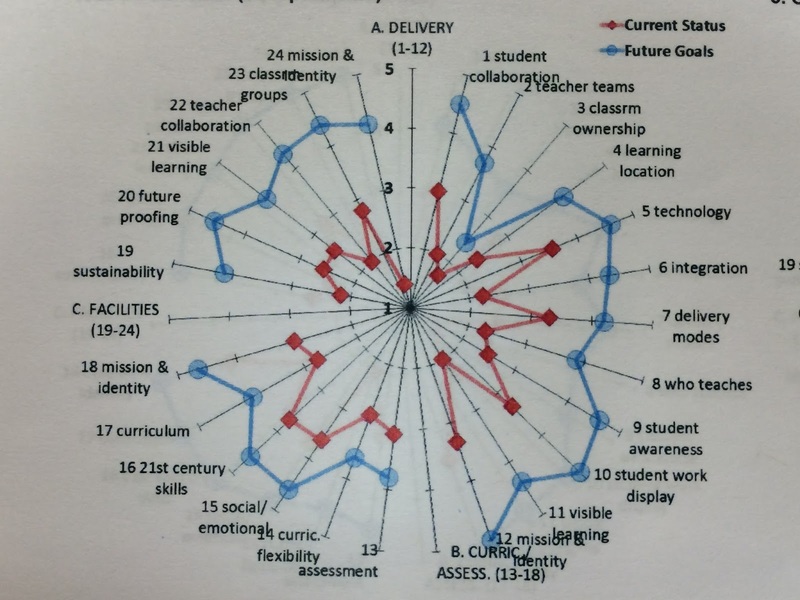 You will notice that red line indicates where faculty see their practice today and the blue line indicates their future goal. The results of this process have proven to be extremely informative. On the whole most faculty members want to move their practice to a more "transformed" place (in a thoughtful and student centred manner). As principal, the burning question for me is: how do we help staff bridge the gap between where they are now and where they want to go? Over the next 12 months we will embark on a process of continuous school improvement. 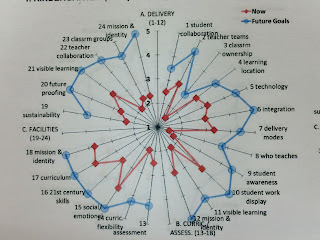 The intent is create a system where faculty and staff can come together in a strategic way to support each other in their desired future goals. An important take away in this continuous improvement plan is NOT to create goals for teachers. Instead, we will create school wide priorities based on the feedback we received. Our priorities will be evidence based, inspiring, future orientated, challenging and inspiring action statements that will give direction to the entire school. From these priorities, departments, sections and teachers will be asked to create goals that make sense for them in their practice and context. This process is not about micromanaging action. It is about taking the collective future possibilities and transforming them into strategic priorities. It is about inspiring and cultivating action that will best serve the learning needs of our students. It should be noted that to support teachers and their goals, we will continue with our Learning Teams initiative (I suspect these teams will become even more focussed and purposeful!). It is a constant truth that teachers care deeply about their students and their learning needs. When it comes to inspiring change, process is as important as product. I love the idea of starting the year with your fundamental question. I also really like the rubic that you developed for teachers. I would love to see the entire rubic. Are you willing to share it. Thanks for taking the time to share your thinking. 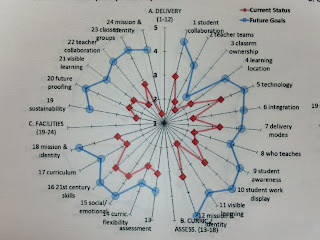 I am interested in your continuum especially around teacher collaboration. In NZ we are building very collaborative learning spaces with 2-6 teachers in a single space and taking shared responsibility for the teaching and learning for all of the children. Possibly 5.5 on your continuum! Whenever I talk with international educators I think they are doing what we are but then find in a collaborative space they teach their 'class' of 25 children and share a common area- different to what we are doing. I am studying this for my thesis and for a fellowship on behalf of Canterbury Principals. Your thoughts?